Inspired by the mix of deep purple (amburgine) and cypress green. Inspired by plaid and hot pink. I wore a plaid men's shirt (Dior!) 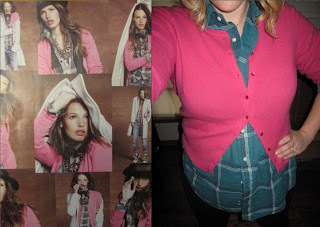 from thrift store with hot pink 3/4 sleeve cardi - Old School Express. Inspired by golden pants mixed with greys and frills. Added the sock trend in hot pink. 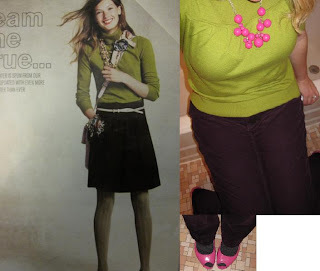 I wore golden hickory cafe capris with Forever21 layers T with long grey Gap Cardigan. Hot pink socks paired with low white wedges...bold? yes. Too out there? probably. Fun? Yup!